Scientists Are ‘Spying On Whales’ To Learn How They Eat, Talk And … Walked? We think of whales as creatures of the sea, but scientists now believe that 40 to 50 million years ago, whales had four legs and lived at least part of their lives on land. As the curator of fossil marine mammals at the Smithsonian Institution’s Natural History Museum in Washington, DC., Pyenson has examined whale fossils that are tens of millions of years old. He has also learned about modern whales by attaching sensors to them in the wild and by studying their carcasses at commercial whaling sites. “We live in the golden age of whale science, because there’s so many new tools that we have to investigate their hidden lives,” he says. Pyenson notes that the largest whales alive today are the biggest vertebrates that have ever existed: “No dinosaur was heavier. No other mammal exceeded their length or width,” he says. “They are absolutely the largest vertebrate animals to have ever evolved in the history of life on Earth. Pyenson’s new book is Spying on Whales. Some species of whales — especially the deep diving ones — can hold their breath for over two hours. And that’s a remarkable feat in its own right, but I think even more so when you consider that in those cases they’re diving over 9,000 feet deep in search of prey. … It’s kind of like holding your breath while chasing after your food for over two hours and then coming back to the surface. And these species of whales — the deep-diving, beaked whales — they do this routinely many times a day. And you can think there’s all kinds of great physiological questions about how this works, how these animals are able to achieve this amazing feat multiple times a day. They are so big and they are so cumbersome to investigate. The tools you need to open up the carcass of a 70-foot mammal are too big to really comprehend. And your opportunities to actually investigate a carcass like that where it hasn’t started to decay are very rare and fleeting. You would think that for all the whales that have ever been killed through the process of whaling all around the world — in the 20th century alone some 2 to 3 million whales were killed through whaling by many nations — yet very few those whales were actually investigated by biologists of any kind. One of the most startling finds was the strange tangle of blood vessels and nerves that we found lodged right in what would be the chin of these whales — sort of the tip of the snout on the lower jaws. … We’re talking about jawbones that are almost the size of telephone poles — each the right and the left jaw — and there’s the space between them. We started putting the different pieces of evidence together … which told us that the nerves and blood vessels were really what we thought they were: pressure sensor devices. 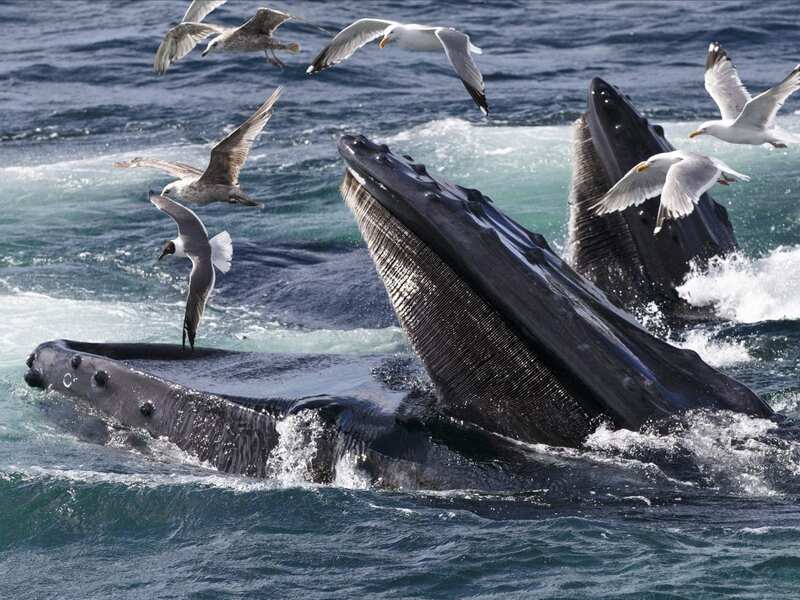 And when we look at the biomechanics of how these animals feed, it appeared to be a way for these very large whales to coordinate just how much their jaws were able to open and close in the course of this lunch feeding activity that they undertake every day. The power of that signal varies based on the body size of these whales. Sperm whales have an incredibly powerful echolocation organ on their skulls that can be up to 20 feet long. By the 1960s the U.S. Navy was funding a lot of research into understanding how echolocation works, because it had such an important technological consequence. And even today, still, the sonar that’s used by the military is not as sophisticated as that of the ones that toothed whales use to navigate the world. The oceans have gotten to be a lot noisier places and this is a big issue for whales whose habitats that they want to feed in overlap directly with the places where our cargo ships and cruise ships most frequently go. And I’m thinking about places like Boston Harbor or port of Los Angeles. Those are two prime spots where there’s a lot of shipping activity, big ships moving out frequently and it is right next to prime habitats for very large baleen whales and so ship strike is a big concern. Whales, even the largest ones, can’t move quickly enough to get out of the way of these ships, which move much faster and are much, much larger. So, unfortunately a lot of whales are victims of ship strike, which is just incredible trauma. Another feature is … the noise, the churning in those engines, makes those environments much noisier. And if you’re a whale a lot of your livelihood depends on acoustics being able to hear and also being able to make sounds, so there’s good evidence that in these busy ports, whales are having to sing and communicate louder and at different frequencies just to get over the noise. Lauren Krenzel and Thea Chaloner produced and edited this interview for broadcast. Bridget Bentz, Molly Seavy-Nesper and Rhitu Chatterjee adapted it for the Web.